It’s no secret that in order to lose weight we need to burn off more calories than we consume. What many women struggle with is having a low metabolic rate. Which means that they naturally burn off few calories throughout each day. Making it very hard to lose fat because they can eat a very limited amount of calories and if they exceed that number they will gain fat. The solution to fix this is definitely not to decrease the amount of calories that you eat. Because if you do that your metabolism will decrease even more, making the situation worse over time. The real solution is increasing your metabolism. If you have a high metabolism you will burn more calories than someone with a low metabolism. This will allow you to eat more than most women but you’ll still lose weight. Muscles burn way more calories than fat. So if you have very little muscle mass you will burn off fewer calorie than someone with a decent amount of muscle. Don’t worry you won’t look like a hulk if you lift weights. Actually we women have about 7-8 times less testosterone than men. Testosterone is the hormone responsible for muscle growth and it’s way harder for us women to build muscle mass than men. So we are simply unable to build “freaky muscles” without using steroids. 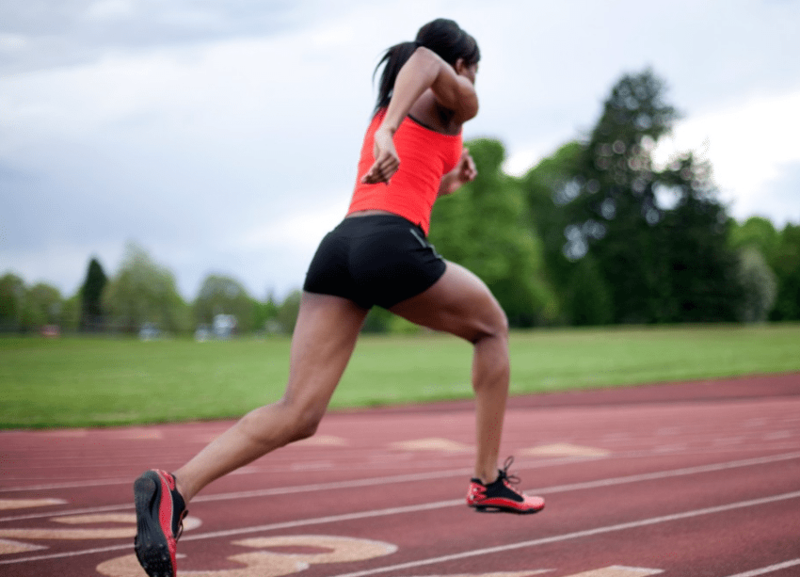 High Intensity Interval Training (HIIT) has proven to be one of the best forms of cardio. Turns out that after doing a very short HIIT workout you can burn of loads of calories and fat post workout. You can expect to increase your metabolism for up to 48 hours after doing HIIT as compared to a steady low intensity cardio like jogging were you will only burn calories throughout the workout. An example of HIIT is sprinting for 1 minute, walking for 1 minute. Repeated 5-10 times. A good fat burner can be a good addition to your daily diet. They can contain ingredients that boost the metabolism and allow you to burn off more calories. Also some of them contain ingredients that eliminate sugar and hunger cravings which is the downfall for many women. They can help burn off that stubborn stomach fat that never seems to go off. You can see my top 3 recommended fat burners in my article by clicking here. Protein is very important for overall health and well being. It’s role is to repair and build body tissues. This is especially important if you are someone who works out. When you workout you break down muscle fibers that need to be repaired. Protein helps repair these muscle fibers and recover after workouts. Most fit women already know this and take their protein intake very seriously. It also plays a critical role in boosting the metabolism. When you consume a source of lean protein for example chicken breast. Your body needs to burn off 30% of it’s calories just to process the food. So if the chicken breast is 200 calories your body burns 60 calories just to process the food. Low calorie diets tend to work for only a short period of time. Once your body gets adapted to the low calorie diet your body goes into starvation mode and shuts down your metabolism. So it’s very important to switch it up from time to time. If you are following a low calorie diet a cheat meal once in a while can be very helpful. This will shock the body and put your metabolism back in gear. Many women that follow very low calorie diets also crash at some point and give up on their diet because it is very limited and they are hungry all the time. Remember that fitness is a journey, try to find a diet or plan you can sustain for a long period of time without crashing. Thanks for reading and please share this article to a friend that does not know this. See you soon and keep following your dreams!